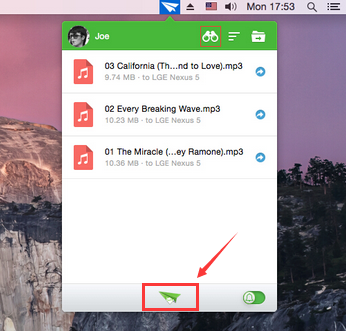 Recently when I open the AirDroid desktop app (31.13) on my Mac (10.10.3) I can't get the main window to open. I see the app in the menu bar but that's it. Since there is no menu option to open a new window I can't use the app. This started happening maybe a month ago. When it started I able to get a main window to open by restarting the app. Now that approach doesn't work. - This problem is recent. It may coincide with an update to the AirDroid app. I'm not sure. - I can use the service in a browser window (Safari 8.0.6). - I uninstalled the desktop app and reinstalled it but that didn't resolve the issue. You can't open AirDroid by clicking the icon on the dock? Can you open it by clicking the icon in menu bar? I have the same issue. The window can indeed be opened with the button in your screenshot, but not through the dock icon or spotlight. The application is also a bit more sporadic and whimsical than before. Refreshing texts doesn't always work, there is always a message saying "Reconnecting" above the list of texts and notifications for new text messages as they are received on the phone seem to be all but completely absent. I just started using AirDroid again and I think I have the same problem. I have AirDroid running but there seems to be no way to open the window with the keyboard? Surely Command-tabbing to AirDroid then Command-O or Command-N could open the window?